When serving our patients we offer exemplary care through well educated and experienced providers who are leaders in their fields. Our care reaches across the term of pregnancy, and we cooperate closely with each patient’s OB/GYN, as necessary. We invite you to explore our services, listed below, and we look forward to speaking with you to better serve your needs and answer any questions. 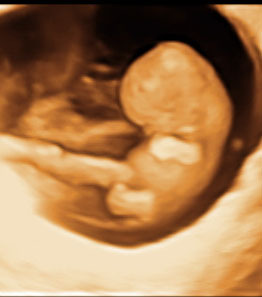 The first trimester is the earliest opportunity to evaluate the fetus for birth defects. The first trimester anatomic scan (FTAS) is a comprehensive fetal evaluation performed between 12 – 14 weeks gestation that detects 40-50 % of major and lethal anomalies. This examination will provide information that is adjunctive to other methods of screening for chromosomal and genetic syndromes. While the FTAS is the earliest opportunity to detect some serious abnormalities, it will not detect all abnormalities and must be followed up by an anatomic fetal evaluation between 18-20 weeks gestation to maximize the prenatal detection of abnormalities. We perform the nuchal translucency measurement as well as fetal nasal bone evaluation at 11-14 weeks. These values, in conjunction with blood work that is sent out by your doctor to a reference laboratory will result in a personal risk estimate for Down syndrome, Trisomy 18 and 13. All of our 15 sonographers and 4 doctors are certified by NTQR for the performance of these tests. We perform comprehensive and targeted fetal anatomic evaluations for patients at increased risk for fetal anomalies, chromosomal defects and growth issues. This includes evaluating patients at high risk of having an abnormality or with a diagnosed or suspected anomaly. We also do fetal and uterine artery Doppler, genetic sonograms, multifetal pregnancy evaluation and diagnostic procedures such as amniocentesis. The genetic sonogram (GS) is a comprehensive fetal ultrasound examination done between 18-20 weeks gestation. This includes a detailed fetal structural survey, biometric measurements and a search for "markers". Markers are variations in normal anatomy, which for the most part, have limited clinical significance. They do however alter the risk that a baby has a chromosomal anomaly. If, after a detailed study, no birth defects or markers are seen, the risk of a baby having a chromosomal abnormality is decreased by at least 50 %. Approximately 15 % of fetuses will have one of the minor markers. The majority of these babies are normal, however, the presence of any of the markers will increase your risk (see the pages on markers) of carrying a baby with a chromosomal abnormality. The initial risk is optimally based on one of many screening protocols that your obstetrician has likely offered to you. If you have the results of your screening tests, bring them with you as it allows us to give you the most detailed information possible. The adjustment in risk can then be used to help parents decide whether or not to proceed with invasive testing such as amniocentesis. Although the risk of Down syndrome can be adjusted using the genetic sonogram, patients must be aware that ultrasound only provides a risk estimate. Ultrasound cannot diagnose Down syndrome and cannot rule it out. Dr. Bromley and Dr. Shipp are specialists in Maternal Fetal Medicine and have a great deal of experience and expertise in performing amniocentesis. We also provide ultrasound guidance for local referring physicians who prefer to do their own procedure. Sonographic imaging of the pelvis includes the evaluation of the uterus and ovaries. This study is used to evaluate patients with abnormal bleeding, pelvic pain, infertility or a family history of gynecologic malignancy. We specialize in second opinions for complex cases where additional expertise and experience is needed and we work closely with the GYN oncologists. We also specialize in patients with pelvic pain and endometriosis, as well as complex pelvic problems. The procedure almost always involves imaging the pelvis through the abdomen as well as transvaginally. The transvaginal examination allows us to get a closer look at your reproductive organs. While a full bladder is not required (unless you have doubt about your ability to tolerated a transvaginal evaluation) we request that you don’t empty your bladder for about an hour before your scan. If you are premenopausal, this scan is optimally performed early in the menstrual cycle (days 4-9) when the lining of the uterus is thin and the ovaries are quiescent. The only exception is if you are referred for a 3D evaluation of the uterus with a question of a uterine shape abnormality, the timing is better later in the menstrual cycle when the lining of the uterus is lush. If you have had prior studies, bringing those films may be helpful in your care. Sonohysterography is a procedure in which a small amount of fluid is put into the uterus. This allows us to distend the walls of the uterus thus providing an optimal image for the detailed evaluation of the lining of the uterus. We are able to diagnose polyps, fibroids impinging on the lining of the uterus and abnormalities in uterine shape. This procedure is most often used in patients with abnormal bleeding or with infertility issues. The preparation is identical to the preparation for the gynecologic ultrasound. In premenopausal patients, it is performed early in the menstrual cycle when the endometrium is as thin as possible. This allows us to visualize small irregularities with greater precision and ensures that you are not pregnant. Some patients find that taking Ibuprofen before the procedure is helpful but it is not necessary. This procedure is associated with a small amount of cramping but most patients do not report it to be painful. We offer a new procedure used in fertility evaluations called HyCoSy, which allows us to evaluate the fallopian tubes without using radiation or dye (no X-rays). During the HyCoSy procedure, the doctor delivers a mixture of saline and air into the uterus and by using ultrasound, can see the bubbles as they travel through the tubes. This can be done in lieu of the hysterosalpingogram. Dr Benacerraf is a radiologist fellowship trained in ultrasound and cross-sectional imaging and does all the non-OB GYN imaging at DUA. We perform physician ordered. 3-dimensional ultrasound for gynecologic and obstetric indications. This technique is particularly useful in gynecology to evaluate abnormalities in uterine shape, measure dimensions of the uterus that can not be seen in standard 2-dimensional imaging and to localize intrauterine contraceptive device. Additionally, the technique allows specific localization of fibroids and polyps. Three-dimentional ultrasound is now used frequently instead of MRI when evaluating the shape of the uterus as well as other pelvic issues. The indications for 3D in obstetrics include evaluating an early pregnancy to determine the location as intrauterine (normal) or to identify the location of a pregnancy that is located in an abnormal position (ectopic). Three-dimensional imaging is also used in the evaluation of fetal anomalies such as facial clefts, ear anomalies and skull deformities. 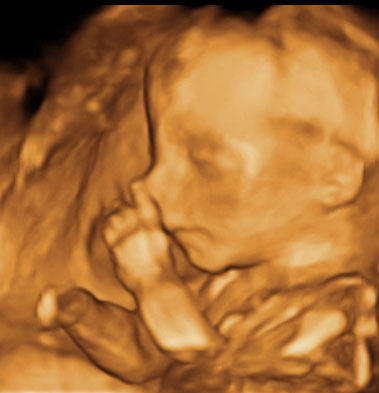 While we do not perform 3D for entertainment purposes, whenever possible, we do try to provide patients with a few 2D and 3D pictures of their baby as a courtesy.